St. Petersburg. View of the cruiser "Aurora"
May 27, 1703 is considered the day of the founding of St. Petersburg. RBTH asked local historian Lev Lurye to tell us about the most fascinating places in the city, some of which cannot be found in the guidebooks. Visit the recently opened "Peter's Basin" panorama with its moving little figures. The layout reproduces the view of the city in the first years of its existence and will be interesting for children and adults. Go to the Catherine Park at Tsarskoye Selo. Most tourists do this. But if you wish to learn about the German princess's youth, you can visit the Oranienbaum Palace-Park ensemble. This is the only royal residence built in the rococo style that has preserved its authenticity and suffered least of all during WWII. If you are interested in the 19th century and who poet Alexander Pushkin was, then you should saunter around the great squares – Palace Square, Senate Square and Arts Square. The famous Russian poet watched as they were created by Italian architect Carlo Rossi in the 1820-1830s. Enter the old Wolf and Beranger Confectioners (Nevsky Prospekt 18, now called the Literary Café). It was here that on Jan. 27, 1837 Pushkin met his second, Danzas. From here they set off for the duel in which the poet was mortally wounded. To get a better understanding of the works of Fyodor Dostoyevsky, explore the neighborhood on the northern side of the Griboyedov Canal near Sennaya Square, which is often called Dostoyevsky's St. Petersburg. There is a building here in which Crime and Punishment protagonist Rodion Raskolnikov supposedly lived. You can also find three houses in the neighborhood in which the writer himself resided. To find out more about the life of Russia's last tsar then head for the nearby town of Tsarskoye Selo. There you can admire the Fyodorovsky Cathedral of the Mother of God, which the royal family often visited. And if you want to learn about Art Nouveau architecture, walk down Kamennostrovsky Prospekt on St. Petersburg’s Petrograd Side and look inside the mansion that belonged to ballerina Mathilde Kschessinska (2 Kuibyshev Street), who was tsarevich and future tsar Nikolai II's favorite in his youth. 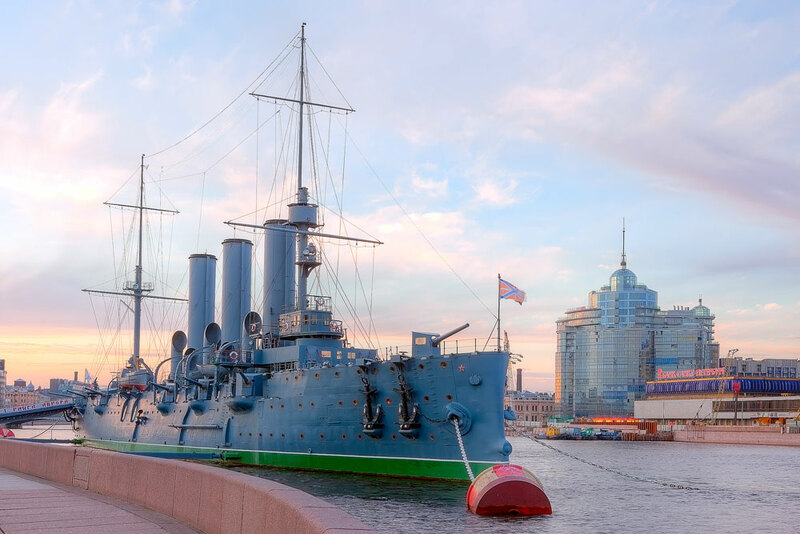 Climb onto the cruiser Aurora (it will return to its mooring after restoration in June), whose blank shot signaled the beginning of the Bolshevik Revolution. You should also see the White Hall of the Smolny Institute, where the event was announced, as well as two museum-apartments: that of the Yelizarov family on the Petrograd Side (once the apartment of Lenin's older sister) and that of the Alliluyev family on 10th Sovetskaya Street (the residence of Joseph Stalin's wife Nadezhda Alliluyeva). The most eloquent witnesses of these events are the places of battle themselves. Travel 30 miles southeast of the city to the Nevsky Pyatachok, the place where the siege was first broken in 1943. The Piskaryovskoye Memorial Cemetery, located in the north of the city, produces a profound impression. Take a look at the Bryantsev Youth Theater (Pionerskaya Square 1) and the Finland Railway Station. The "spirits" of the stilyagi (a Soviet youth subculture whose ideal was the American way of life) walk along the sunny side of Nevsky Prospekt, from Vladimirsky Prospekt to Vosstaniya Square. It was here, at 49 Nevsky Prospekt, that the famous Saigon Café used to stand, whose habitués were those stilyagi and all the famous artists and writers, including Joseph Brodsky and Sergei Dovlatov. In order to feel the atmosphere of that period visit the David Goloschekin Jazz Philharmonic at 27 Zagorodny Prospekt. To steep yourself in the dissident spirit of the late 1980s, head boldly to the Pushkinskaya 10 Cultural Center, the USSR's first art squat, created in 1989. It contains many small museums and galleries, recording studios for Russian rock musicians and the recently built Museum of Leningrad Rock. For those who can’t get enough of Russia’s macho leader, have a look at the Snegirev Hospital where he was born, the building at 12 Baskov Lane where he lived and where his first school, #193, was located. And of course the Smolny Institute where he began his political career.